lySocial media measurement is your insurance policy coverage for opportunities and unanticipated events. The numbers don’t lie. While social media strategy lays out a road map for your success, no one can plan for everything. Changes in technology, changing trends, or new issues in your industry can all present new challenges. Since social media measurement allows you to measure your performance against your goals, you are able to make adjustments. That’s why social media analytics are so important. What are your top performing posts? What time of day do your posts get the most engagement? Is your marketing strategy translating to traffic and leads? If you’re not using social media analytics tools, you’ll probably have a hard time answering these questions. Having all of your analytics in one place makes it easier to track and compare your efforts across multiple profiles and platforms. Google Analytics (GA) is one of the best ways to track social media campaigns and even help you measure social ROI. You probably already have GA setup on your website to monitor and analyze your traffic. However, by using UTM parameters in your social media posts, you can also track specific social media campaigns. What if you could pull all that data onto visual dashboards tailored to your specific goals and tracking strategy? I’ve always said that there are no silver bullets in marketing. Aesop’s fable of “The Tortoise and the Hare” comes to mind – slow and steady wins the race. In my research, I looked to Buffer , Sprout Social , Keyhole , and Social Media Examiner for a list and reviews of the best social media measurement tools available. For my small business audience, I’m looking for a simple and affordable solution. My biggest challenge in this area is streamlining the process, keeping it simple yet robust. The name of Cyfe kept coming up. I had set up an account with them almost two years ago. Even though I liked the dashboard visuals, I wasn’t able to sync my newsletters to a dashboard. Being too busy to resolve the issue, I simply canceled my subscription. I hadn’t looked at their features in over a year! I have to say that what I found out surprised me. Cyfe is fast becoming an all-in-one business dashboard solution. Besides offering social media, they also have web analytics, marketing, sales, support and infrastructure widgets too. You can monitor everything – company-wide! 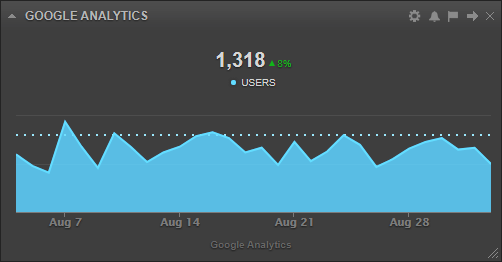 As a result, the dashboard options now include social media analytics, Google Analytics, Alexa and Chart Beat analytics. In addition, they’ve added SEO widgets; Advertising Widgets; Basecamp for project management; sales and finance widgets, including Eventbrite and Quickbooks; more email widgets, including ActiveCampaign; monitoring widgets like Google Alerts and AWS CloudWatch; and even Zendesk for customer service. The Data Mash Up Widget adds, subtracts, multiplies, divides, slices & dices unrelated metrics from completely different apps to create new business intelligence data for your organization & clients. The Alerts Feature monitors metrics even when you’re away from your dashboards via email or SMS notifications. The Business Goals Feature benchmarks metrics against your business objectives with on-screen goals, a great way to identify areas of improvement within your organization. The best way to take a look at all that’s included is to go to their knowledge base. After reviewing their Freemium offer, I decided to look at their premium option. Cyfe Premium gives you unlimited dashboards and widgets, historical data, exports, sharing options, customizations and more. All for just $19/user/month. What I found hidden in the premium account is their publisher widget . First of all, you can view your previously-published content. You can also publish to multiple networks all at once (including the attachment of images). Finally, you can schedule or edit content to be published in the future, whenever you want. This is what absolutely sold me on this solution! I now have a publishing platform, marketing (social media AND email marketing) analytics and dashboard hub AND a business dashboard hub all in one place. WOW! What do you think? Anybody joining me in the new Cyfe tribe?